August is the hottest month of the year in Morocco. For people who are heat sensitive, August can be an incredibly challenging month to visit this beautiful North African country. 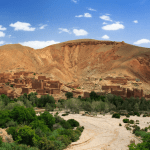 But if you have your heart set on a visit to Morocco in August, there are ways to make it work. 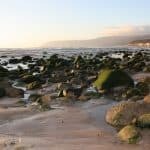 Focusing your visit on coastal or mountain locations is a helpful way to make those summer temperatures bearable. Another great thing to do is follow the lead of the locals, and find ways to stay inside during the hottest part of the day. Temperatures grow cooler after the sun goes down, and many areas come to life in the evening, no matter how quiet they may seem during the day. When booking accommodations, keep in mind that many places do not have air conditioning, or have limited air conditioning so if this is an important consideration for you, be sure to choose carefully and book early to make sure you have a comfortable place to relax when you need it. In Morocco, the hottest month of the year is August. Temperatures range from 29°C to over 45°C, depending on the area of the country you are visiting. The sun is very direct during the summer, and most people do their best to avoid the midday sun. Temperatures are more bearable along the Atlantic and Mediterranean coastlines and the High Atlas mountains, with the hottest areas being the inland locations like Marrakech and the Sahara. August is also the driest month of the year, with little to no rainfall. 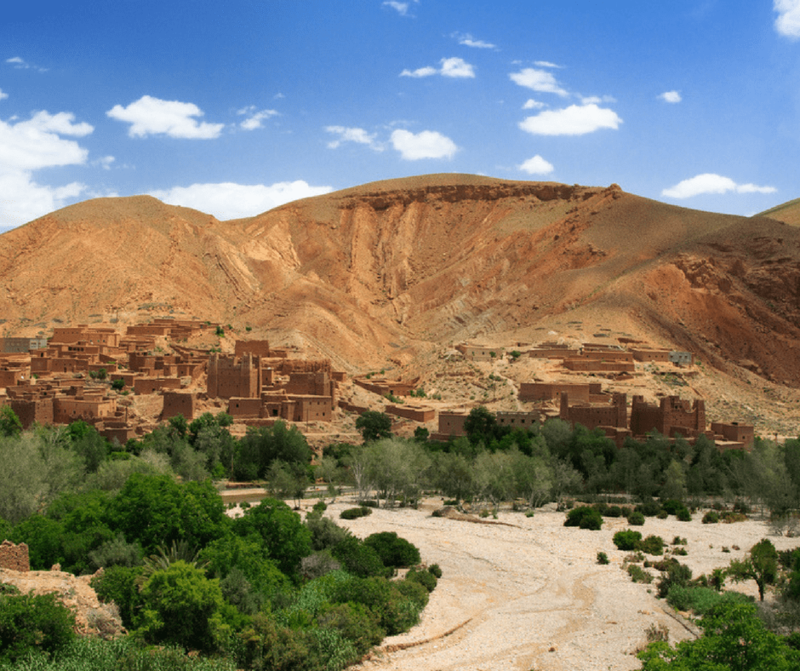 For this reason, if you explore Morocco in August, be sure to keep water with you as much as possible. When packing for a Moroccan vacation in August, the primary consideration is finding ways to stay cool. Loose fitting clothing is best, especially clothing that covers you and protects you from the sun without overheating you. While shorts, tank tops, and bathing suits may be perfectly welcome in many of the tourist locations, if you spend time among the locals, you will have a more comfortable time if you make sure your knees and shoulders are covered. Some items to keep in mind for your vacation travels are shorts, light slacks, short sleeved shirts, long skirts, capri pants, and loose-fitting jeans. Think about light, loose fabrics made with natural fibers. Be sure to take your favorite comfortable shoes for walking and plenty of socks. Wide-brimmed hats, light scarves for covering your hair or shoulders, and sunglasses to protect your eyes are always great to have. And you may even want to consider bringing an umbrella, so you can carry your own shade with you wherever you go. Need more advice? Check out these posts on what to wear in summer and what to wear to the beach! Early August – Moussem Moulay Abdellah Amghar – This sacred yearly event takes place in early August on the Atlantic coastline, 9 km from El Jadida. More than 500,000 Muslims pitch tents and join in this week-long religious event, enjoying music and fellowship as they express their faith. When exploring Morocco in August, it is good to keep in mind different ways to enjoy the sights while staying cool. Spending the majority of your time in the coastal regions is one of the best ways to beat the heat. Planning activities that will keep you inside during the hottest part of the day is a great idea, as well. With so many wonderful restaurants, beautiful museums, and historical locations to explore, there are many ways you can find to hide from the sun during the hottest part of the day. You can also spend middays relaxing in your hotel before heading out later in the day when the sun goes down. In the evenings, there are even more wonderful experiences to enjoy as you explore the local souks for delicious food and handcrafted items. When it comes to staying cool during August in Morocco, the best thing to do is follow the lead of the locals, stay well-hydrated, and keep your plans as flexible as possible. As long as you stay mindful of the heat, your summertime trip to Morocco can be the vacation of your dreams! 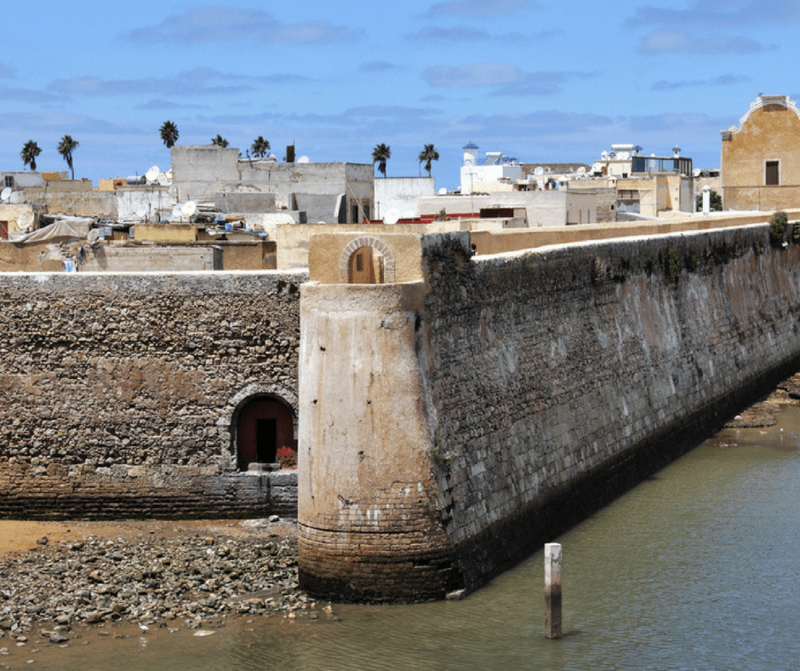 Located approximately 100 km south of Casablanca, El Jadida is a lovely walled city on the Atlantic coast of Morocco. The old city is registered as a UNESCO World Heritage Site and is known for the ancient Portuguese influence in the walls, homes, mosques, and old harbor. Historians will want to make sure they stop by the Portuguese Cistern while in the old city. This massive structure will be familiar to fans of the Orson Welles movie “Othello”, as it was the filming location for the fight scene between Cassio and Roderigo. Next to the Cistern is a small Cistern Museum with a wonderful collection of books, documents, and photographs of this historical location. Another great place to step back in history is the Mazagan Fortress, which was built in the early 1500s during the Portuguese Occupation. This UNESCO World Heritage site is a classic example of a star-shaped coastal fortress and offers great views of the surrounding area. El Jadida is extremely popular with Moroccans living in other areas of the country so if you would like to visit during August, you will want to make your reservations well in advance. 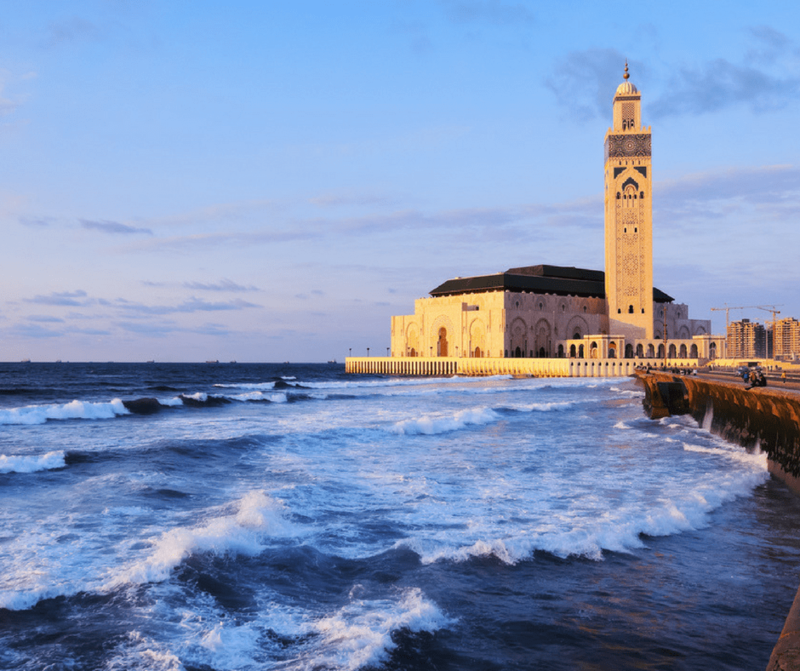 One great place to escape from the August heat is Casablanca, the largest city in Morocco. This modern city’s coastal location provides cooling breezes to help you stay comfortable while you explore all this city has to offer. One of the most beautiful locations to be found in Casablanca, the Hassan II Mosque is one of the only mosques in Morocco that non-Muslims are allowed to enter. (You must dress conservatively in long pants/skirts and no exposed shoulders.) This mosque is stunningly beautiful, with tilework, marble fountains, and other examples of Moroccan architecture. If you’re looking for souvenirs or gifts, be sure to make time to visit the Old Medina, located near the harbor. This 19th-century marketplace is filled with vendors selling bags, baskets, jewelry, pottery, and other handcrafted goods, as well as an amazing assortment of delicious food. Tangier is a major port city on the Mediterranean coast of Morocco. This popular tourist destination is busy and vibrant, with cooling breezes to take the edge off those hot August days. Escape from the sun for a while in St. Andrew’s Church. Built in 1905, this beautiful building is an architectural masterpiece, reflecting the multicultural population of Morocco. Although primarily a Christian church, the Moorish interior includes Quranic Inscriptions and marks the direction to Mecca for Muslim prayers. 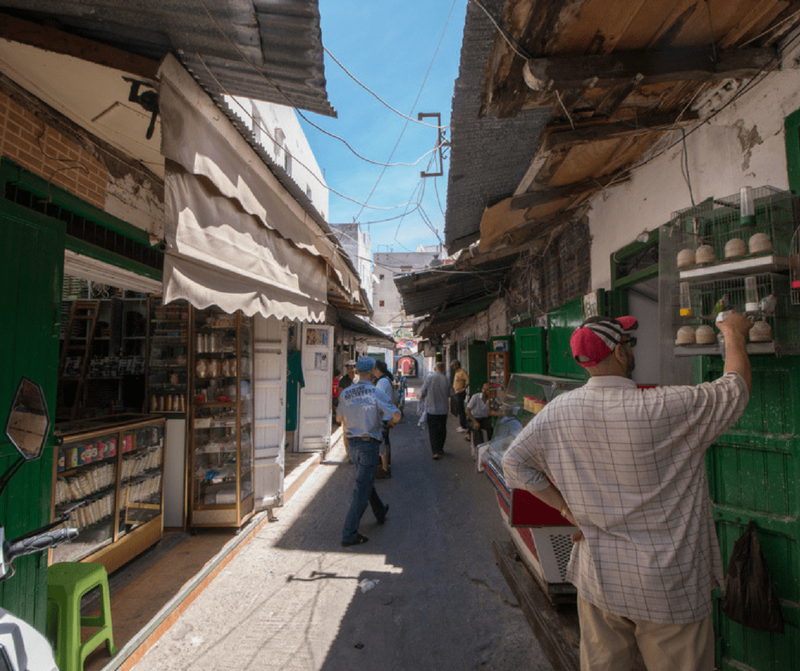 To see an interesting bit of American history in Morocco, be sure to visit the Tangier American Legation – the first American public property outside of the United States. Morocco was the first country to recognize America as a brand new country after the Revolutionary War. Stepping within these walls will transport you back in time. Located on the Mediterranean coast, the city of Nador is a great location to visit during the hot days of August. Founded in the 19th century, this city was under Spanish rule until 1956. Nador is separated from the Mediterranean sea by a salt lagoon and is an excellent place to visit for nature lovers and bird watchers. It is quite possible to see herons, egrets, pink flamingos, and many more wonderful birds while enjoying the fresh salt air and cooling breezes. If you have access to a vehicle, take a drive along the Rocade, the coastal road between Nador and Al-Hoceima. This lovely road features amazing views of cliffs, gorges, hills, and the beautiful Mediterranean Sea. If August is your favorite time to take a vacation, the Moroccan coastline is waiting there, just for you. Don’t let the heat scare you away from enjoying that North African hospitality!